Students in Stonehill College’s Moreau Honors Program form lasting habits of reflection, assessment and discernment through intellectual engagement, service learning, community involvement and team building. An active and close-knit community, highly motivated to succeed in matters of both the mind and heart, Moreau Honors students take control over their learning as they uncover new interests and develop new skills. Blessed Fr. Basil Moreau, C.S.C. Stonehill’s Honors Program is named for and inspired by the educational principles of Blessed Fr. 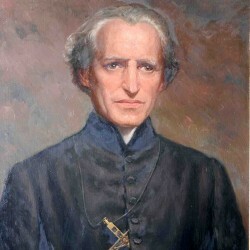 Basil Moreau, C.S.C., founder of the Congregation of Holy Cross. The Moreau Honors Program generally draws its members from applicants whose high school experiences demonstrate strong academic, extracurricular, service, and leadership qualities. Students interested in being considered for the Moreau Honors Program are encouraged to apply when they submit their common application for admission to the College. The Admission Committee works in concert with the Director of the Moreau Honors Program and the Dean of Academic Achievement in the review and selection of candidates. The Committee actively seeks those students who feel as though they will thrive in the close-knit culture described above and who are motivated by the thoughtful, creative, self-reflective, and globally minded character of the Moreau Honors Program. If you have any questions regarding the program itself please contact the director at honors-director@stonehill.edu. In order to be considered for the Program, students must submit an essay (600 words max) that addresses the following prompts. Students have the option of submitting their essays at the point of application or via email to admission@stonehill.edu by the time of their specific admission application deadline. Students are typically notified of their acceptance into the Honors Program two to three weeks following an offer of admission to the College. To graduate as a Moreau Honors Scholar, you must successfully complete a minimum of 15 credits in Honors courses in addition to the Honors First-Year Seminar and the Honors Senior Seminar. Honors Scholars must earn at least 3.50 cumulative and Honors GPAs. Students who fulfill the requirements of the Honors Program graduate from the College with the special designation "Moreau Honors Scholar" and receive a distinctive medallion at Commencement to emphasize this status and wear it over their robes. Graduate schools and employers are always on the lookout for exceptional candidates, those who have distinguished themselves personally and professionally. The status of Moreau Honors Scholar signals uncommon character and academic accomplishment and enhances other achievements featured on a curriculum vitae or résumé.